New enrolment data from the Australian government shows that the Australian international education sector is, at best, in the early stages of recovery. HE (Higher Education): Enrolments declined by 4.3% and commencements declined by 6.4% (looking at 2012 vs. 2011 figures). China (40.8%) was the largest market contributing to enrolment volume in this sector, followed by Malaysia (7.1%). VET (Vocational Education): Enrolments declined by 14.2% and commencements declined by 12.4%. India was the largest market contributing to enrolments (27.5%) and commencements (23.0%), followed by China (10.9% of enrolments), Thailand (6.5% of enrolments), and Korea (6.3% of enrolments). ELICOS (English Language Intensive Courses for Overseas Students): Enrolments grew by 0.2% and commencements grew by 4.2%. China was the largest ELICOS market in 2012 with a 26.4% share of enrolments and a 25.9% share of commencements, followed by Brazil (9.0% of enrolments), Korea (7.8% of enrolments), and Colombia (7.3% of enrolments). Schools: Enrolments fell by 10.3% and commencements declined by 7.4%. China was the largest market for schools with 45% of enrolments, but commencements from China fell by 7.4%. The largest sources of international students for Australia are Asian countries, China and India in particular. The proportion of Chinese students in the overall Australian international education sector is now 29%, while Indian students make up 10.5%. There were declines in the contributions of Chinese and Indian students to the sector, however: -6.2% and -24.5%, respectively, year-over-year. The top five international student markets (by volume of enrolments) for Australia are China, India, Korea, Vietnam, and Malaysia. Next are Nepal, Pakistan, Colombia, Philippines, Sri Lanka, and Germany – noteworthy is the fact that enrolments from Pakistan, Colombia, and the Philippines grew year-over-year from 2011 to 2012 (by 18.1%, 13.8%, and 20.6%, respectively). Further background on the Australian education sector in recent years can be found in last year’s ICEF Monitor article “Australian international education sector braces for a long hard recovery“. The fact that ELICOS registered a small gain in enrolments (0.2%) and a more substantial one in commencements (4.2%) may be a first positive sign for the overall Australian international education sector – despite the declines other sectors registered in 2012 compared to 2011. This is because of the role and nature of the ELICOS sector: it has been described as a “pipeline” and as a “canary in the coalmine” in relation to the rest of the system, since it is very often the first – but not the only – stop for international students studying in Australia. 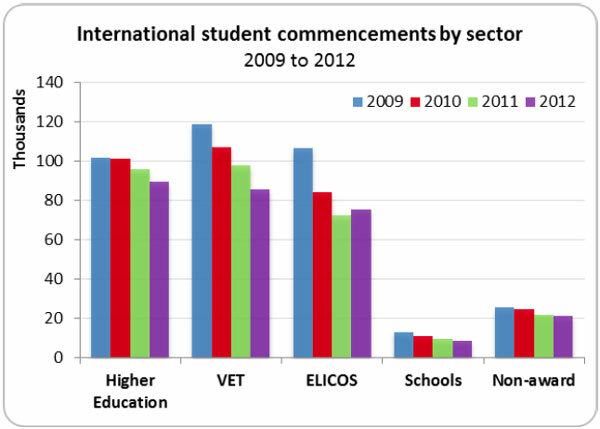 This means that growth in ELICOS (which just last year received very good grades from students in it) may translate to growth in other sectors such as higher education in future years, since a portion of the international students who have begin ELICOS studies (i.e., commencements) will go on to pursue degrees or other certification in Australia. What else will it take for Australia to recover? While the news of the ELICOS stabilisation is a bright spot amid a fairly bleak overall picture, everyone knows that the recovery of the Australian international education market is dependent to a large degree on the visa and immigration climate within the country. While governmental reforms introduced in 2012 positively affected university-bound international students’ visa, work, and immigration prospects in Australia, many question whether they have done enough for the ELICOS and VET sectors. Because of the reforms, all international student graduates can now stay in the country for at least two years to work. In addition, all bachelor-level students are now classified as “low-risk” when it comes to how their study visa applications are assessed, regardless of what country they come from, which speeds up the application process for them. There were other reforms passed as well, on the basis of 41 recommendations in the 2011 Knight Review, but most of them are considered to be targeting the university sector rather than the ELICOS and VET sectors. For more on ACPET’s position regarding the importance of extending the Knight Review recommendations to the ELICOS and VET sectors, please follow this link. This entry was posted in Australia, Australia/Oceania, Higher Education, Language Learning, Most Popular, Regions, Research, Vocational and tagged Most Popular, immigration reform, vocational studies, Trend Alert, higher education reform. Indian, Pakistani enrolments drop sharply in UK; is new promotion agency the solution?